Cell boosters are more affordable than ever but that doesn’t mean you want to go replacing them every year. It’s still a few more dollars than most people would feel comfortable just throwing away. On the other hand, if you choose your booster wisely you’ll end up being able to keep a lot of the equipment for years and years, occasionally upgrading the electronic components because sadly, nothing last forever. Why would you want a cell booster at all? Studies have shown over and over again that up to 90% of people could benefit from cellular boosters. A cell booster is nothing but a small, weak radio at its heart and it’s susceptible to interference from buildings, wiring, and other radio sources. Although cell phones generally only need to reach a tower a mile or so away (or less) they generally have barely enough power to do that. There are two purposes to having a cell booster. First of all, it eliminates the problems caused by the way your home or office is built. All-metal construction, stucco mesh, bricks with a lot of iron in them… all these factors can contribute to reduced cell reception inside the home. By using an antenna mounted outdoors and a repeater unit indoors, you’re going to get the same signal quality or better than you get outdoors. By mounting the outdoor antenna up high, you’re cutting down on the barriers between you and the towers, for even better reception. The second purpose is to give you a clear, strong signal inside the home. A cell booster’s indoor transmitter is strong enough to carpet your home and office with much more signal than it would get even if you are outside. That’s right, in many cases you’ll actually get more bars inside than outside because the indoor unit is amplifying the signal before sending it out to you. Are you using existing wiring? If you have leftover cable TV or antenna wire that you’re not using, that can be used for the connection between indoor and outdoor units in many cases. If that’s the case, you want a booster that uses 75 ohm cable with F connectors. Most of the newer kits for home and small office use do use this sort of cable, while the industrial kits still use the 50 ohm cable with N connectors. It’s possible to convert from one type of cable to another, but it’s much more expensive than you’d think. Do you need an omni antenna or a directional one? Often times, an omnidirectional antenna is the best bet because you’ll find different carriers using different cell towers in different directions. 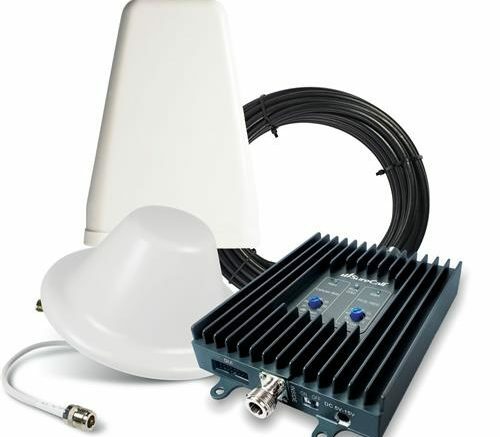 However, if you know that all your towers lie in a particular direction, you’ll get better results with a directional antenna which can concentrate its receiving ability on a small area. Will you need to cover a large area? If you’re talking about an area larger than most homes, for example a large warehouse, you’ll want to consider multiple indoor antennas and a super-strong booster, or multiple boosters. Often times these indoor antennas can be used long after the base unit has been upgraded or replaced, because they contain no moving parts or electronic components. At this point I could certainly set you free with our selection of cellular products, but you’re much better off getting a customized quote from one of our experts. It’s free and easy! Or, if you do prefer self-service, shop cellular products at Solid Signal.